This is the central hub in Vortex displaying the various dashlets that allow you quick access to your mod tools, new files, site news, and more. You can move the dashlets around by clicking and holding the icon to the left of the X in the top right corner of the individual dashlet you would like to move. Dashlets can be disabled by clicking the X in the top right corner, or by accessing your settings, where you can choose which dashlet/widget to show. “Introduction Video” - plays an introductory video that explains the basics of Vortex. Note that parts of the corresponding video series by Gopher might be outdated at this point in time. “Handle Nexus Links” if set to “Yes”, all downloads initiated via the “Mod Manager Download” button on file pages on Nexus Mods will be handled by Vortex. If set to “No” Vortex will not handle these links. “Profile Management” toggles Vortex’s mod profile functionality on or off. “View Advanced Settings” toggles the advanced settings on (or off), giving you access to more involved options. “Scan for missing games” launches the game search which will automatically look for any of the games supported by Vortex on your hard drive. “FNIS Integration” - for Skyrim and Skyrim Special Edition only: this toggles the corresponding "Automation" setting. If enabled Vortex, will automatically update FNIS when you deploy a mod. 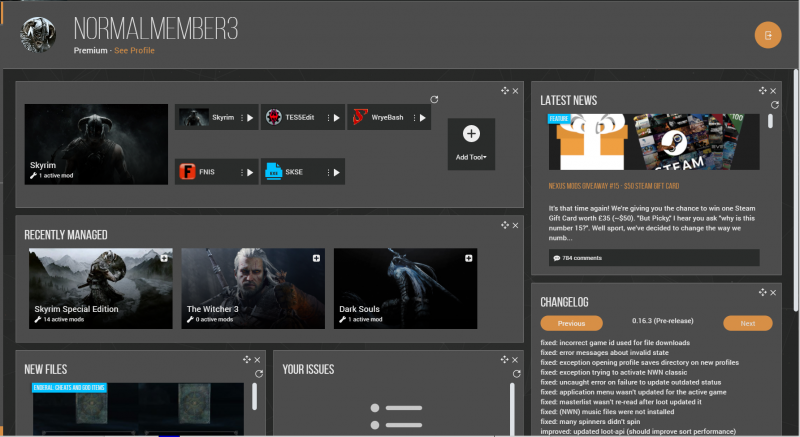 This dashlet gives you quick access to various modding tools. Depending on the game, there might be one or several preconfigured tools, but you can easily add any custom or not preconfigured modding tool for quick access. This is a shortlist of the games that you have recently managed with Vortex. Click on “activate” on any of those to switch game mode and set them as the actively managed game. Clicking the plus (+) in the top right corner will reveal meta data for the game as well as several options to e.g. 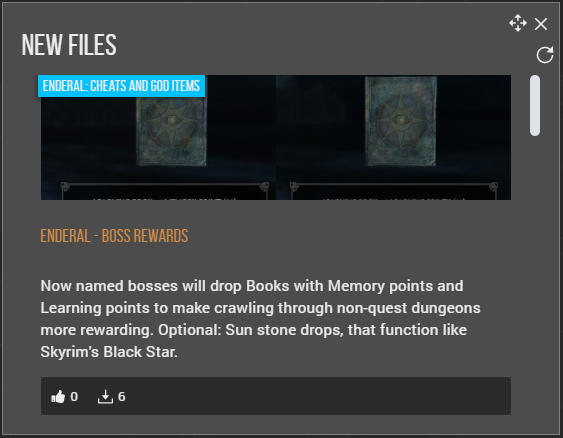 open the corresponding game folder, mod folder, or Nexus Mods page. You can also manually change the game’s location. The new files dashlet allows you to learn about the most recent mod uploads for the game you are currently managing from within Vortex. The dashlet displays the mod category, a header image, the mod name (which also serves as a link to the corresponding file page), a short description, as well as endorsements and total file downloads. This dashlet allows you to keep up to date with the latest Nexus Mods news, giveaways, and mod author interviews from within Vortex. The changelog contains information about what is new in your current Vortex version. 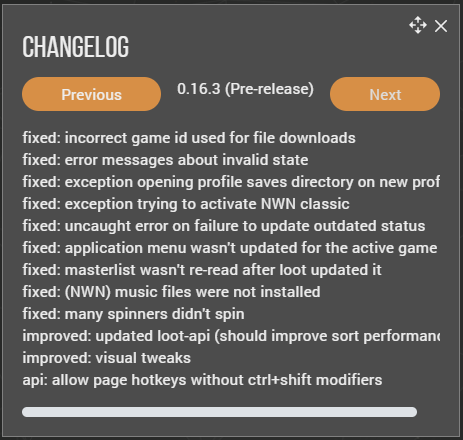 You can also view past Vortex versions' changelogs by clicking "Previous" (click "Next" to navigate to more recent changelogs). If you have reported issues via GitHub, this dashlet will help you keep track of them. This dashlet displays your avatar, username, and provides a link to your Nexus Mods profile. This dashlets provides you with a convenient link to "Arctool" which is needed for some games such as Dragon's Dogma. Navigation in Vortex is facilitated by the navigation area on the left-hand side. You can collapse the navigation area in order to free up space for the main window. To do so, simply click the arrow button in the bottom left corner. The navigation area is divided into two sub-groups: General and Mods. This is a list of Vortex extensions which can be enabled/disabled individually. Extensions are modules that expand Vortex’s capabilities, without interfering with its core functionality. This allows us, as well as users, to create optional and additional modules for Vortex to e.g. managing new games, new types of mods, add tools etc. To install extensions, drag and drop files into the dropzone at the bottom. This is where all your mod downloads are listed. This includes mods directly downloaded via the “Mod Manager Download” button (if Vortex is set to handle those), as well as mod archives you drag into the field labelled “Drop URL(s) or File(s)” at the bottom of the screen. Downloads can be sorted and/or filtered by Filename, Name (Mod name), Game, Download date, File Size, and Download Progress. Clicking the cog next to “Actions” on the right allows you to enable/disable individual sorting options. The button between the dropzone (“Drop URL(s) or File(s)”) and the list of downloads can be used to quickly toggle between showing all downloads, or just downloads that have not been installed yet. Downloaded mods can be easily installed from within the download section by clicking the “Install” button. This screen displays the games currently managed by Vortex, games that have been discovered i.e. found on your hard drive, and the complete list of games that are supported by Vortex. You can perform a Quickscan for games installed on your hard drive by clicking the button in the top left corner. In the top right corner, on the other hand, you can easily switch between list and grid view. For your managed games, the “Activate” button on the game’s preview tile (corresponds to the checkmark in list view) switches the game mode to the selected game allowing you to add or manage your mods for that specific game. In grid view, the plus (+) in the top right corner, unveils a context menu with metadata about the game, as well as some quick links to the game’s root directory, mod folder, and Nexus Mods page. From there, you can also set the game’s location manually or hide the game from being displayed in Vortex. In list view, the plus (+) can be found on the right-hand side. Discovered games are games that Vortex has found on your hard drive, by conducting e.g. a Quickscan, but which are not yet managed by Vortex. To manage them, simply click the button in the middle of the game’s preview tile (corresponds to the checkmark in list view). Supported games is a list of all the games which Vortex is able to manage. Please note that games on your hard drive which have either been discovered by Vortex or games that Vortex is currently managing for you are not included in this list. If you do not wish to perform a game scan, you can set your games’ locations manually from this list by clicking the “Manually Set Location” button in the middle of the preview tile (corresponds to the three dots in list view). Opens the Vortex section of our help centre allowing you to conveniently access documentation from within Vortex and find answers for e.g. the most frequently asked questions. You are currently viewing our support centre for Vortex. Here you can access and define your settings and preferences regarding Vortex’s user interface and functionality. Language: choose between English or one of the translations. To install a translation, download one from Nexus Mods, extract the contents to "%AppData%\Roaming\Vortex\" and restart Vortex. You should then be able to select the newly installed localisation from the language drop-down. Custom Window Title Bar: This option, which requires a restart of Vortex, will display a normal windows title bar if switched off, and utilise Vortex’s custom title bar if turned on. Enable Desktop Notifications: Allows/Disallows Vortex to send desktop notifications i.e. messages in the bottom right of your screen e.g. when downloading a file via Vortex. Enable advanced mode: This toggles access to several features that are intended to be used by experienced users, but which might seem daunting to new users. Advanced mode is toggled off by default. The features include access to the “Extensions” section on the side menu, quick mode to set up plugin dependencies, and the ability to change the path of a discovered game by clicking it in list view. Enable Profile management: Gives you access to mod profile management via a side menu entry labelled “Profiles”. This option is turned off by default. Deploy mods when Enabled: Toggles between automatic and manual deployment of mods. This option is turned on by default. Run FNIS on Deployment Event: This option is limited to Skyrim and Skyrim SE. If enabled, Vortex will run FNIS (Fore’s New Idles in Skyrim) on every mod deployment, ensuring that your animation and behaviour files are updated appropriately. Allows you to toggle the various dashlets displayed on your Dashboard on or off. Multi-User Mode: allows you to switch between user-specific "Per-User" Vortex profiles, or, conversely, one "Shared" profile for every user on the same PC. Update: allows you to switch between "Stable", "Testing", and "No automatic updates". If set to "Stable", Vortex will only propose updates considered stable for public use. If set to "Testing" Vortex will also propose available updates that are not deemed stable for public use. "No automatic updates" will disable Vortex's automatic update feature. Here you can set the base, download, and install path for the currently managed game, its downloads, and mods. You can further switch the deployment method from “hardlink” to “move” deployment. Note that the latter is in an experimental stage and users who choose to switch to move deployment do so at their own risk. In this section of the settings, you can allow Vortex to handle the “Mod Manager Download” buttons found on Nexus Mods file pages. 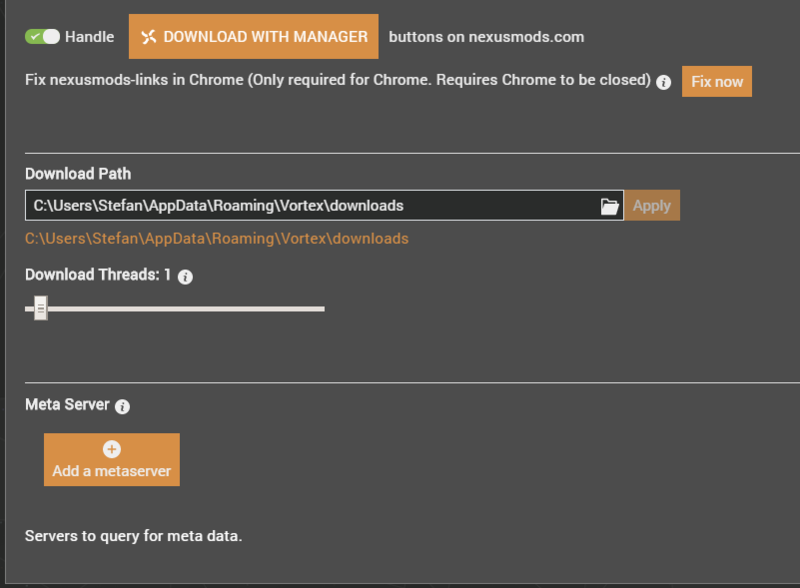 For Chrome users, there is an optional fix which changes a configuration file in Chrome to allow an external program (Vortex in this case) to handle Nexus Mods “Mod Manager Download” links. This fix is not required if you are not using Google Chrome. Download Path: Allows you to specify the folder Vortex downloads mods into. Download Threads: This setting allows you to customise the number of parallel download requests to the server. Whether this would benefit your download speed depends on your Internet Service Provider and/or router and on whether your download speed per request is capped. Meta Server: Here you can add one or several meta servers which provide metadata (additional information about mods). Mods downloaded from Nexus Mods have this data served by default, however, if third parties were to add download servers, this would be the place to add meta servers providing metadata for downloaded mods. This section lets you specify which directories and/or paths Vortex searches when scanning for games. Clicking the “Reset” button will set it to the default directory (usually C:). Some games have optional workarounds. E.g. Fallout New Vegas has an option to redirect BSAs which adds functionality to Vortex similar to mods like Archive Invalidation Invalidated. In this setting, you can freely adjust and customise your Vortex theme regarding, font and header sizes, colour schemes etc. To start off, click the “Clone” button. This creates a duplicate of the default theme. Enter a name for your new theme and click “Clone” again. You can now freely edit your new theme and adjust the font and font sizes, margins, headings, and colour scheme to your liking. To restore the default option, simply select “default” from the theme drop-down menu. To delete a theme, select it and click “Remove” next to “Clone”. This is the central hub for mod management giving you quick access to tools and information needed to organise your mods. Install From File: allows you to install a mod from a selected file archive. Check for Mod Updates: quickly scans your installed mods (both currently enabled as well as disabled mods) for updates and notifies you if there is a new version available for download (see example below). Categories: opens up the category management dialogue that enables you to rename, reorder, or add entirely new categories. Mod categories are meant to help you organise your mods. Mod categories are not to be confused with mod groups, which are in turn intended to resolve plugin conflicts in broader strokes than plugin specific rules. Deploy Mods: this deploys all the currently enabled mods to your game. If you have disabled automatic deployment in your settings, deploying your mods this way is a mandatory step to actually “activate” your mods, and apply any recently set (or changed) rules and overrides. Purge Mods: this option is only available if you have enabled advanced mode in your settings. Purging is the opposite of deployment: it removes all the links Vortex previously installed. This is not a destructive operation and can easily be undone by clicking "Deploy Mods" to restore the links. 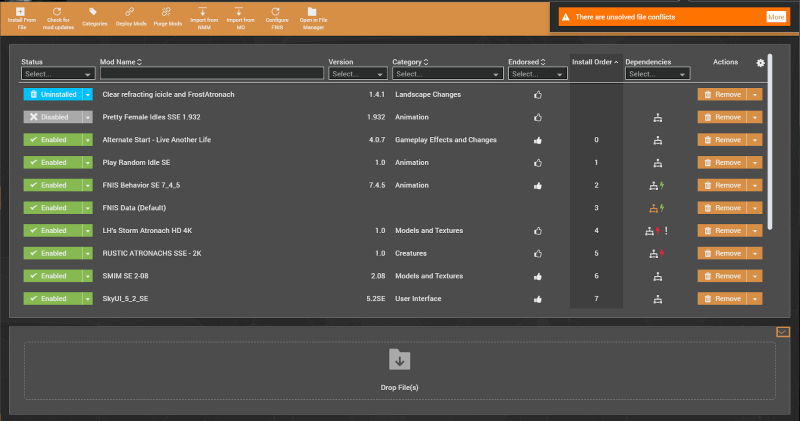 Import from...: Allows you to import your mod install from Nexus Mod Manager or Mod Organizer. See Migrating to Vortex from another Mod Manager. Open...: Open either you game installation folder, game mods folder or Vortex mods folder for the current game. Configure FNIS: allows you to select the FNIS patches to activate when FNIS is run automatically at mod deployment - if “Automatically run FNIS on every deployment” is enabled in your settings. Tutorials: selects a tutorial video covering the specified topic from a dropdown list and plays it from within Vortex. Status: allows you to filter your mod list for Enabled/Disabled/Uninstalled mods. Mod Name: allows you to sort, filter, or search by mod name. Version: filters by mods that have updates available. Installation Time: allows you to filter by (approximate) installation time. Pick a date to filter for mods you installed on a given date. Click the "equal" symbol (=) to toggle between "greater-than or equal" (≥), "less-than or equal" (≤), and "equal" to filter for mods installed on or before, or, respectively, on or after a given date. Source: filters mods by download source. If the source is unknown, Vortex will list the source as "None". Category: filters mods by categories (corresponding to the categories for the given game on the Nexus Mods website). Note that only categories with one or several mods for them are included in this list. Endorsed: filters mods by endorsement status. "Endorsed" lists mods you have endorsed via Vortex. "Abstained" lists mods you had endorsed at one point, but chose to "unendorse" again. "Undecided" lists mods you haven't endorsed yet. "N/A" lists mods downloaded from other sources than Nexus Mods / mods that are not linked to the Nexus Mods endorsement system. Install Order: arranges mods in the order they are loaded by Vortex. The mod with the highest index number loads last. Dependencies: filters for mods that are in conflict with one another. "Conflict" lists mods with conflicts you have addressed by setting a rule and/or individual file overrides (indicated by the green lightning bolt). "Unsolved" lists conflicting mods which you have not addressed yet (indicated by the red lightning bolt). Highlight: allows you to create visual highlights for mods in your list by clicking the icon in the column and selecting a colour and/or icon for it. 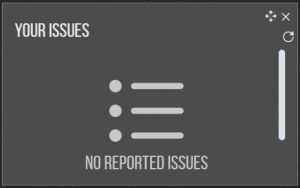 Actions: lists the default action for this mod depending on mod status (Never installed/Enabled/Disabled). You can select an action from the dropdown menu by clicking the arrow symbol. Cog icon (settings): allows you to individually toggle any of the table headers on or off. 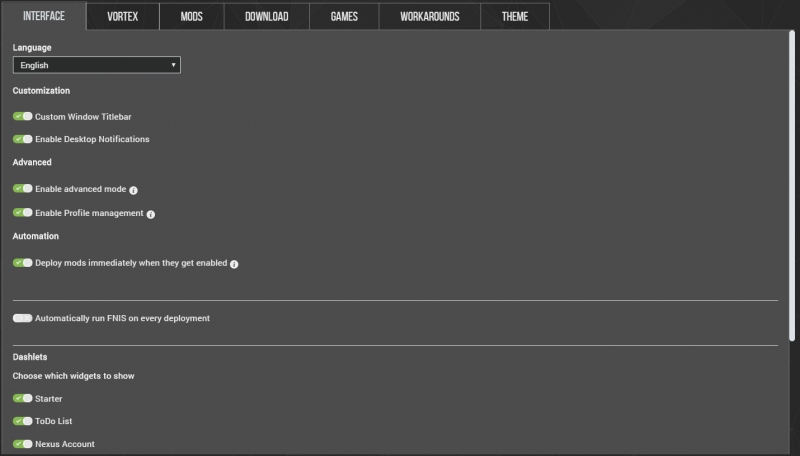 Launches the game specific Nexus Mods site for the currently managed game. 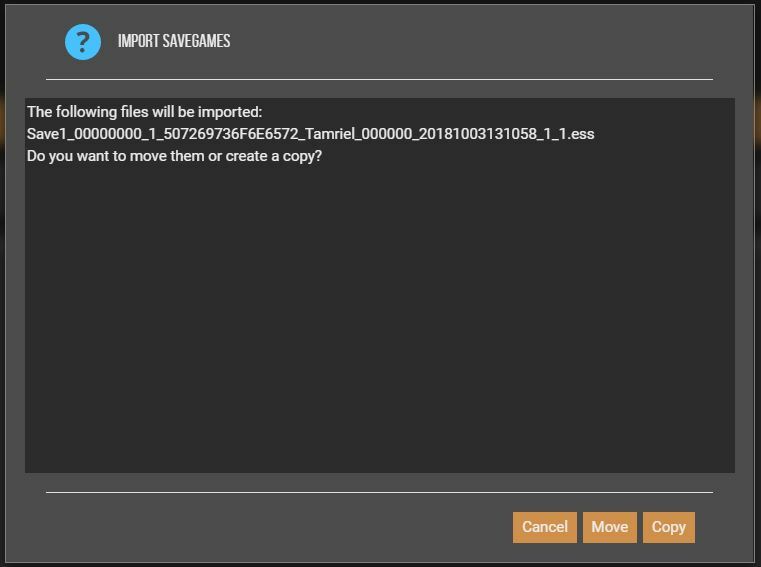 You can drag and drop mod file archives into this field to add them to your mod list. Click the arrow button in the top right of the dropzone to hide it. Double-click any mod in your mod list to bring up the mod details pane providing you with additional information about the mod in question. The preview image is identical to the first image/tile image of a given mod. Clicking on the hyperlinked short summary will let you view the mod’s full description from within Vortex. Mod Name: this corresponds to the name of the mod file from a given mod page that you have downloaded. 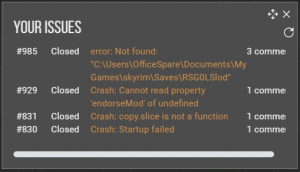 Author: lists the author of the mod and corresponds to the “Created by” field on Nexus Mods. Version: lists the version of the downloaded mod. A “warning” here merely means that the mod is not following the semantic versioning standard (three numbers separated by dots) and is not indicative of an error. Variant: indicates which variant of the mod is active. You can have multiple variants i.e. installations of the same mod with different settings which you can toggle between. Installation Time: provides you with the date and time of installation for the mod in question. Source: indicates where the mod was donwloaded from. Category: allows you to assign the mod to a specific category. By default, mods are assigned to the corresponding Nexus Mods category. Game Section: indicates which game section the mod was downloaded from. 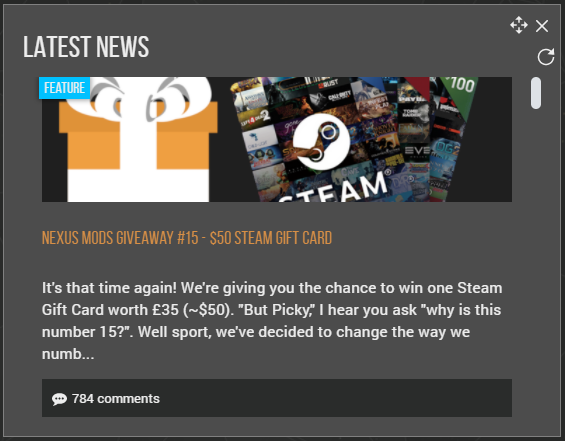 Nexus Mod ID: this is the ID found on the mod’s Nexus Mods page. 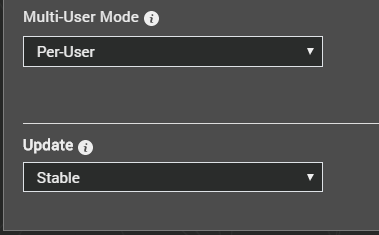 You can conveniently open the corresponding mod page in your browser by clicking the “Visit on www.nexusmods.com link” below the “Nexus Mod ID” field. Mod Type: allows you to specify a given mod’s type which will impact where (and even how) the mod in question is deployed. The availability of different types is game specific. Skyrim, for example, allows for “default”, “dinput”, and “enb”. The field labelled “Write your own notes on this mod” can be useful if you want to add your own notes about a specific mod to help you keep track of a mod’s effects or peculiarities. Autosort enabled/disabled: allows you to enable/disable autosorting. If disabled, Vortex will not sort your plugin list unless prompted to do so by clicking the adjacent “Sort now” button. Sort now: prompts Vortex to sort your plugin list according to LOOT and your specified rules. Please note that Vortex will sort automatically unless automatic sorting is disabled. Manage Rules: gives you access to the rule management dialogue where you can set or specify custom rules to sort your plugin list. Manage Groups: opens the group management dialogue which is intended to solve mod conflicts in broader strokes than plugin specific rules. Status: allows you to filter your plugin list for Enabled/Disabled/Loaded by engine. Note: "Loaded by engine" are plugins that are required for the game to work and thus cannot be disabled such as e.g. Skyrim.esm and Update.esm. Name: allows you to filter by plugin name. Mod: arranges your plugin list according to the corresponding mod name of a given plugin (arranged alphabetically). Mod Category: arranges your plugin list according to the corresponding mod category (arranged alphabetically). Master Displays only "master files" indicated by the star icon (*.esm files or so-called "fake esms" i.e. *.esp files which have been flagged as master files in their respective file headers, as well as *.esl files which are referred to as "light masters"). Light Master Filters for so-called "light masters" which are mostly *.esl files (or *.esp files which have been flagged as such in their file header). Native Filters for plugins that are loaded by the engine and cannot have their load order changed. Dirty Filters for plugins that "need cleaning" according to LOOT. See also: What does "cleaning your plugin" mean? Attention This plugin has outstanding LOOT messages. This could be missing masters, dependencies or other information. Load Order: arranges the view of your plugin list according to the load order (or the reverse). Note that plugins are loaded in the order indicated by the indices (0, 1, 2, 3, 4, 5...) and not according to the currently displayed view. Mod index: arranges your plugins by mod index number. Group: lists/arranges your plugins by group (alphabetically). Dependencies: you can use the icons in this column to set plugin specific rules. To do so, click and drag one connector (icon) to another, which will bring up the "Set rules" dialogue. Alternatively, you can click a connector icon and select "Edit". In this mode, you can select any number of other plugins to quickly set up several "load after" rules. Indicates that no rule/dependency has been set up on this plugin. Click and drag to another connector (same icon) to set up a rule. Indicates that either a rule has been set on this plugin, or that LOOT has information regarding this plugin. Click the icon to reveal additional information from LOOT on e.g. this plugin's incompatibilities. This is where you manage your save games from within Vortex. To find the exact save game you are looking for, Vortex enables you to filter by Save Game ID, Character name, Character level, Ingame location, Filename, and Creation Time. The individual columns can be toggled by clicking the cog next to “Actions” in the top right corner. 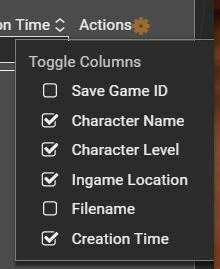 In the "Actions" column, you can choose to delete the save game or to restore a given save game’s plugin list. The latter can be especially useful when you want to try out one or several mods and then return to your previous setup. This page was last edited on 21 November 2018, at 13:12.